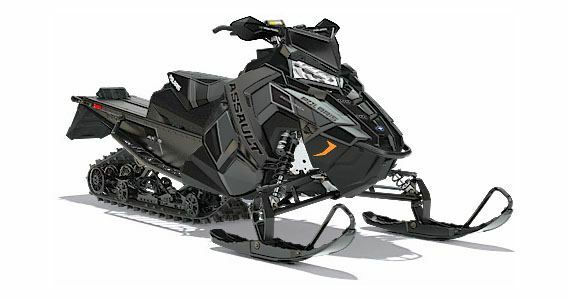 The 600 Switchback® Assault snowmobile is for backcountry riders that demand off-trail agility and on-trail confidence. Its powerful, proven 600 Cleanfire® engine paired with the AXYS® Chassis and IGX 144 Rear Suspension deliver Rider-Balanced™ Control, Unrivaled Acceleration, and Rider Centric Comfort. AXYS® CHASSIS: The NEW AXYS chassis for the 144 platform is light and strong, offering rider balanced characteristics critical for the 50/50 rider. The rider is moved into a balanced position on the sled so it rides flat through the corners. When the trail gets rough or the rider jumps off into the powder, rider balance enables the rider to move back and make the front end light to climb up on top of the snow or the moguls. IGX 144 REAR SUSPENSION: A core element to the new AXYS 144 platform is the all new Ideal Geometry X-Over 144 uncoupled rear suspension, which offers the ultimate blend of durability and strength. The IGX 144 rear suspension provides RMK-inspired off-trail agility and balance with a drastically improved on-trail ride. Pitch is controlled through geometry in this new rear suspension. With 43% more front torque arm travel, this sled features reduced bottoming and less drag off-trail. An all new optimized, lighter, tipped rail beam design gives the sled a nimble feel. POLARIS MESSAGECENTER GAUGE: Informative and easy to read, this instrumentation keeps a rider aware of sled operating conditions and provides a wealth of additional data. Easily viewable LCD screen, 4.3 in. diagonal measurement. Scrolling message center keeps rider informed. Increased number of tell tales by over 60%. Large buttons can be operated with gloved hands. Brightly lit display is easily readable in all light conditions. INTERACTIVE DIGITAL DISPLAY: Another industry first for Polaris - the most advanced instrumentation in snowmobiling. This 4.3 in. 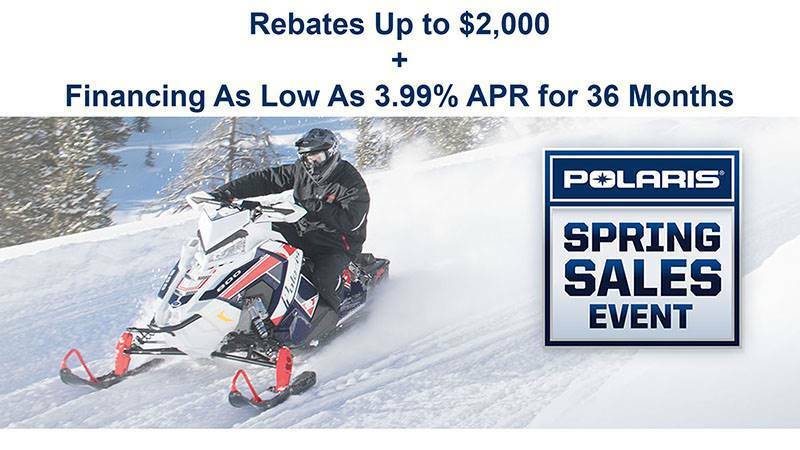 high resolution, full color, LCD digital display provides a rider with information including: Sled performance - Speedometer, tachometer, dual tripmeters, average speed, max speed, engine/trip hours & odometer Sled operating conditions: Coolant temperature, diagnostics & maintenance warnings. Riding conditions - Air temperature, time of day in 12 or 24-hour clock format. Bluetooth™ functionality - Enables the gauge to communicate with the rider’s cell phone and provide notification of incoming calls or texts. Displays phone battery & signal strength. GPS/Mapping Capability - A compass is standard, & full-featured GPS can be installed to provide directions & information about services such as fuel, restaurants, lodging & Polaris dealerships. Customize the GPS to operate with North Up or Course Up navigation depending on your preference. Ride Planning Feature enables you to plan a ride using Ride Command, save it as a GPX file, and transfer it to the display through the USB interface. This gauge comes as an option on some SnowCheck models, and is available as an accessory option. INTEGRATED STORAGE: Provides 1024 cubic inches of secure storage space. Weather-tight design seals out snow. Storage can be accessed through zippered and velcro enclosure that is covered by additional material and buckle down straps. Bag is attached and located underneath the seat and tank and atop the tunnel. Combination of semi-rigid, compression-molded materials and polyester. LIGHTWEIGHT: At 456 lb., the Switchback ASSAULT on the AXYS 144 platform is the industry-leading lightweight 50/50 crossover snowmobile. It allows you to get up on top of deep snow faster and offers quick acceleration. 600 CLEANFIRE® ENGINE: This liquid-cooled Cleanfire® engine with semi-direct injection (SDI) deliver outstanding throttle response and instant acceleration. These powerful, efficient engines start easily and reliably and they calibrate automatically as the temperature and elevation change. These engines deliver impressive fuel economy in real-world riding situations, which, for Polaris riders, means aggressive, up-tempo riding, not low-rev lab conditions. Now in the AXYS® chassis, the 600 engine features lightweight integrated mounts, electronic oil pump and bypass thermostat.